Many plants and animals share their lives in the Lower Sugar River Watershed with us. It’s up to us to ensure that they have the habitat they need to survive and thrive! Fortunately, there are a lot of things we can do to encourage a healthy ecosystem. Farmers can create natural buffers along stream banks to encourage the re-establishment of native plants and wildlife. This helps prevent erosion to stream banks, reduces soil loss and added sediment load downstream, and aids in the improvement of water quality. Homeowners can encourage native birds by planting native plants and creating a bird-friendly habitat with natural cover and food sources. Native plants require less attention and water than exotic species, as they have evolved to live in our part of the country with cold, windy winters and hot, dry summers. They also foster native insects, which in turn attract the birds that feed on these insects. 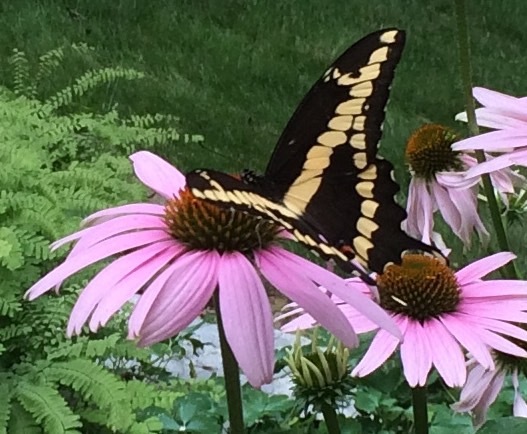 Native butterflies will sip nectar on your native flowers thereby pollinating them. Birds feed on the resulting fruits and seeds. Don’t cut down your wildflowers in the fall. Wait until growth starts again in the spring to cut back the old growth to give our wildlife a refuge from winter weather. Did you know that birding is one of the fastest growing pastimes in the nation? Creating healthy ecosystems where native bird species can thrive will also attract avid bird watchers. These folks will likely look for places to eat, stay overnight, and shop, thereby infusing outside money into the economy of the watershed.